How wonderful to finally have the chance to see Carrie the Musical – that most infamous of Broadway flops. Based on Stephen King’s 1974 novel and Brian de Palma’s 1976 movie, it opened on Broadway in 1988 where it survived just 16 previews and five performances. It comes to Sydney now in the reworked version seen off-Broadway in 2012 thanks to independent musical theatre company Squabbalogic. Not only is praise due to Squabbalogic for staging the musical here for the first time but they have timed it well given the release this week of Kimberly Peirce’s film remake. 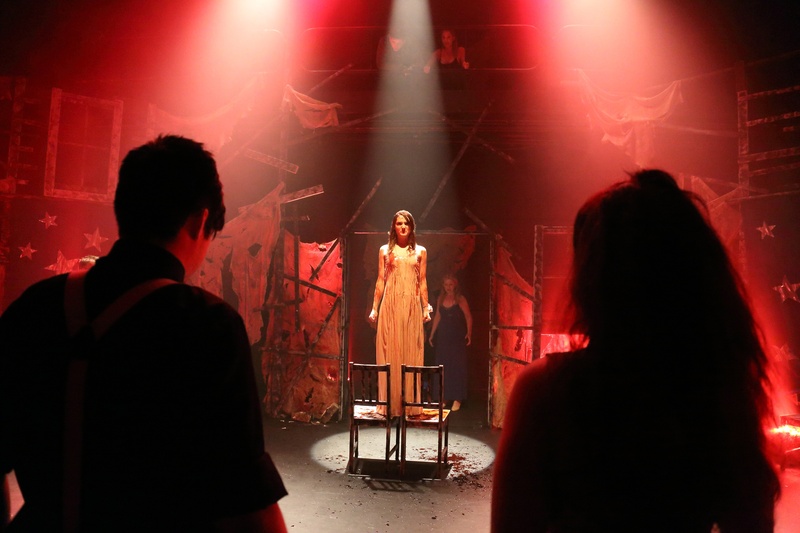 As most would know, the story centres on Carrie, a teenage misfit with a fanatically religious mother who is bullied remorselessly at school. Life isn’t much better at home, particularly when her mother discovers that Carrie has begun menstruating and treats it like the proverbial ‘curse’ from God. Discovering that she has telekinetic powers, Carrie eventually takes terrible revenge when the bullying turns decidedly nasty at the high school prom. It would be so easy to camp it up but director Jay James-Moody has played it straight, directing a terrific production, complete with litres of blood, that hones in on genuine emotion and human drama wherever he can find it. Despite the rewrite, the musical – with music by Michael Gore, lyrics by Dean Pitchford and book by Lawrence D. Cohen – hasn’t ironed out all its problems. The book doesn’t have a great deal of emotional and psychological depth, while the new framing device, which has nice girl Sue (the sole survivor from the prom) telling the story in flashback via interrogation, feels clunky and unnecessary. The lyrics, meanwhile, too often veer to the obvious. Having said all that, I thoroughly enjoyed the show and felt for Carrie – here movingly portrayed by Hilary Cole in a very impressive Sydney debut. Set in a burnt out gym, with tattered drapes adding a spooky feel, Sean Minahan’s set creates just the right atmosphere, while the telekinetic effects are nicely done. James-Moody directs with a great deal of assurance and love, establishing a convincingly teenage vibe with his young, enthusiastic cast. 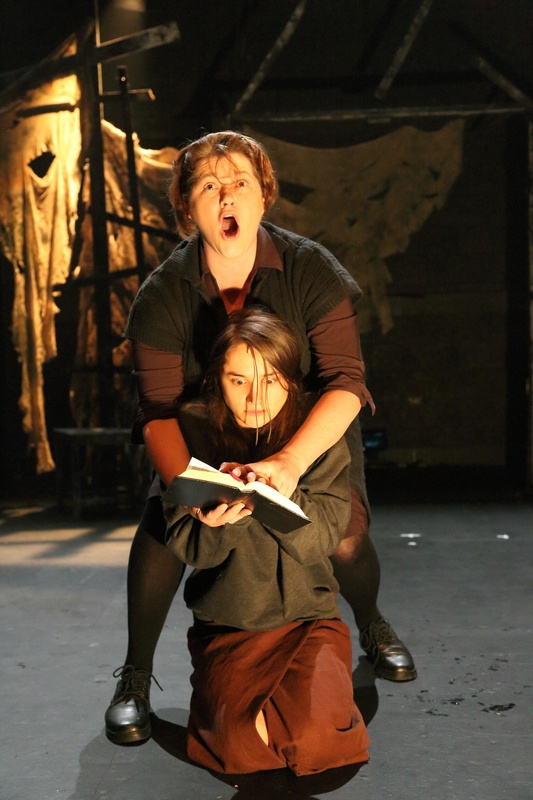 The most powerful scenes (and this is to do with the writing) are between Carrie and her mother Margaret – here superbly performed by Cole and Margi de Ferranti. Cole is a real find. Petite and pretty, she makes a very believable transformation from dowdy outcast in baggy clothes– her shoulders hunched, her eyes constantly downcast – to blossoming Prom Queen. Her pure voice is lovely and she sings from the soul, really connecting to the lyrics so that your heart goes out to her. De Ferranti is in fine form vocally and dramatically as Carrie’s bitter, fanatical mother, giving her a crazed air. Beneath Margaret’s avenging fear and Carrie’s desperate need to escape, the two of them convincing portray the needy love between them. Adèle Parkinson is also lovely as all-American-girl-with-a-heart-of-gold Sue, with strong support from Prudence Holloway as bad girl Chris, Toby Francis as her too-easily led, loser boyfriend Billy, Rob Johnson as good guy Tommy, Garry Scale as wry teacher Mr Stephens and Bridget Keating as Miss Gardner, along with the rest of the ensemble (Tim Dal Cortivo, Jaimie Leigh Johnson, Andy Johnston, Monique Sallé, Zach Smith and Maryann Wright). Musical director Mark Chamberlain leads a sharp, eight-piece band, seated in the balcony above the stage. Despite the show’s shortcomings, Squabbalogic once again give us a smart, high-energy, engaging production of a rarely seen musical that musical theatre aficionados won’t want to miss.